Geomembranes | Tirpal Udyog - Tarpaulins, Canvas, Silpaulin, PVC Coated, HDPE/LDPE Coated Fabrics, Drill, Twill, Suede, Air Mesh..
Geomembranes are the most widely used products for solid waste containment (such as landfill liners), mining and water containment applications. Tirpal udyog uses the highest quality resins to manufacture the widest selection of high-density polyethylene (HDPE) and linear low-density polyethylene (LLDPE) geomembrane products available in either a black, green or white upper surface, and in either a smooth or textured single or double-sided surface.Geomembranes are available with a conductive lower surface to allow for effective leak testing of installed geomembrane. 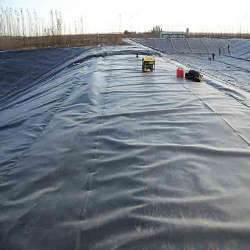 PVC (Polyvinyl Chloride) Geomembranes is a highly flexible waterproofing geomembrane. It is a thermoplastic material manufactured from a mixture of vinyl compounds, plasticizers and stabilizers. PVC Geomembranes has excellent puncture, abrasive, and tear-resistant properties. Backed by rich industry experience, we are engaged in offering an extensive range of HDPE. This HDPE Geomembrane is fabricated by our experts using supreme class fibers & yarns with the help of latest weaving machines in compliance with the international standards. 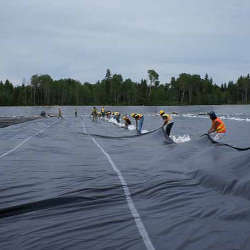 High-density polyethylene (HDPE) is the most widely used geomembrane in the world, and is the preferred product for lining projects. LLDPE smooth geomembranes are designed for waste containment applications that require greater flexibility and elongation performance. 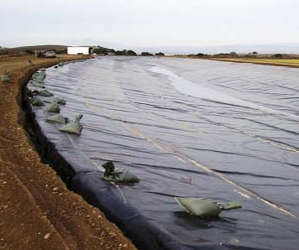 Our superior tensile properties make LLDPE smooth geomembrane liners the perfect solution for applications in which flexibility and elongation are most important, such as: Solid Waste Landfills, Hazardous Waste Landfills and C & D Landfills, Mining, Industrial and municipal water and wastewater treatment.